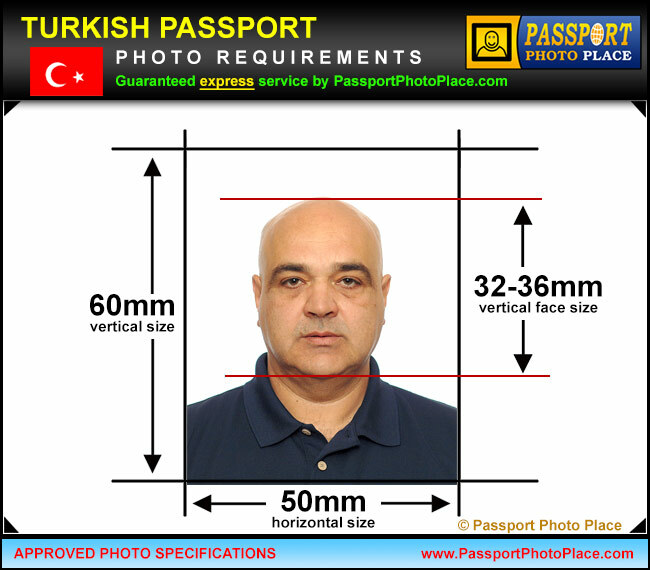 Passport Photo Place provides same-day Turkish passport pictures service. We take and print TR passport pictures following the exact requirements as provided by the Embassy of Turkey. Turkish passport photos must be printed. Electronic files for web upload are currently not accepted. Turkish Consulate General strongly suggests applicants who are seeking to apply or renew for Turkish passport, use a professional photo studio that provides legal documentation photos and photographs for travel and immigration documents. This helps to avoid passport application processing delays and Turkey passport photo document rejections. Passport Photo Place provides same-day guaranteed photo service and produces pictures that 100% compliant with the Turkish Consulate General requirements that assists in applications approval. Guaranteed Turkey passport photo service. No Rejects! All Turkish passport pictures are taken and printed by the most recently updated requirements as provided by the Turkish Embassy and Consulate General in Miami, FL. All photographs are produced by a professional photographer (in-studio) that specializes in legal passport and visa document photography for all immigration and travel documents. Passport Photo Place delivers great looking pictures that are optimized with studio lighting and equipment to naturally represent the individuals applying for passports. We utilize the most recent photo acquisition and picture printing equipment to consistently produce printed photographs that are reliably accepted worldwide and in Consulate General of Turkey. All Turkey passport pictures are taken and printed at our studio in Orlando, FL and are immediately available for pick up. Head covering or scarfs that obstruct any part of the face or neck must be removed. Please wear a solid-colored top/shirt. White or slightly off-white tops are not recommended since the background for Turkey passport photographs is white and there must be a defined contrast between clothing, subject and the background. Our Orlando, FL Orange County picture studio is accessible via major routes and in relatively close proximity from the following: Aloma, Altamonte Springs FL, Apopka FL, Apopka, Azalea Park, Belle Isle, Bithlo, Buena Ventura Lakes, Cambell, Casselberry, Casselbery, Celebration Florida, Celebration, Christmas FL, Christmas, Chuluota, Clermont, Cloud FL, Cocoa Beach, Cocoa FL, Cocoa, Conway, Davenport, Doctor Phillips, Eatonville, Edgewood, Fairview Shores, Fairvilla, Fern Park, Forest City, Goldenrod, Gotha, Hiawassee, Holden Heights FL, Hunters Creek, Kissimmee, Lake Buena Vista, Lake Butler, Lakeland, Lockhard, Lockhart, Longwood FL, Maitland, Meadow Woods, Merritt Island and Cocoa Beach, Mims, Narcoossee, Oak Ridge FL, Oakland, Ocoee, Orlando FL, Orlando Florida, Orlando International Airport, Orlando, Orlo vista, Orlovista, Oviedo Florida, Oviedo, Paradise Heights FL, Pine Castle, Pine Hills, Port Saint John, Rosemont FL, Sanford, Sky Lake, South Apopka, St. Cloud, Tildenville, Titusville FL, Titusville, Union Park, University Park FL, Windermere FL, Windermere, Winter Garden FL, Winter Park and Winter Springs.